A URL — short for uniform resource locator — is the human-readable text that specifies the location of a resource (usually a web page) on the internet. The URL also designates how to retrieve that page, also known as the "protocol". Protocol: HTTP, HTTPS, FTP, etc. The protocol defines the method in which the browser and server will communicate to retrieve a page. The protocol sets the rules regarding syntax, error handling, security and more. Domain: An identifier that represents the IP address of a website. The rules of mapping a domain to an IP address are set by the Domain Name System. Browsers use a DNS lookup to find the IP address of a domain you enter into your browser. Top-level domain: Usually shortened to TLD, the top-level domain is perhaps best defined as the categorization of the websites. For example, .gov for government websites, .edu for educational sites and .com for general purpose sites. Some URLs contain a fourth part: a subdomain. A subdomain is, simply put, a domain within a domain. Technically speaking, all domains are subdomains of the TLD. So, with en.example.com, "en" is a subdomain of “example”, which itself is a subdomain of the “com” TLD. With URLs that use www in front of the domain are technically using the www subdomain. When you get beyond a website’s homepage, URLs get a bit longer. The "page" page is available in the “subcategory” subfolder of the “category” folder. Some (many) URLs contain some text after the page. Sometimes they will have a file extension, like .html or .pdf. We know file extension doesn’t impact rankings because Matt Cutts told us that back in 2009. URLs can also contain what are called URL parameters, query parameters or query strings. A URL parameter is anything that appears after a question mark in a URL. In this URL, https://www.example.com/shirts/t-shirts?color=red&size=medium, the URL parameters are color=red and size=medium. As you can probably guess, this URL is for a page that contains a list of products(t-shirts) that’s been filtered by color and size. URL parameters are often used to serve dynamic content, such as filtered and sorted lists, for tracking purposes (often known as UTMs, usually associated with Google Analytics), or for pagination (?page=1, ?page=2, etc.). You’ll also see URLs that have hashes (the # character), followed by some text, at the end of the URL: https://www.example.com/page#section1. A hash points to a fragment (also known as a "subordinate resource") on the page. URL hashes are what allow you to link to different sections of a page, like in a table of contents. Wikipedia uses these all the time. How Does URL Affect SEO? Your URLs and URL structure can have an impact on SEO. They can have a direct impact (there are ranking signals associated with the URL), as well as an indirect impact through user experience and user behavior signals. URL structure does have an impact on ranking in the form of HTTPS. Google has used HTTPS to give sites a ranking boost since 2014, and is now marking pages that don’t use HTTPS as "unsafe" in its Chrome browser. In their 2017 study of ranking factors, Searchmetrics found 37% of top 20 results are HTTPS URLs, while HTTPS pages make up 45% of the top 10. More recent studies have put the number at more than 70% for the top 10. However, despite the well-established importance of HTTPS for rankings, only 29% of sites reviewed by WooRank are secure! Set up a free SSL certificate for your site using our partner, SecureMyWebsite.net. The power of keywords used in URLs as a ranking factor has been declining for years. As Google gets better and better at interpreting page content, it relies less and less on the URL to tell it what a page is about. In fact, a Searchmetrics study from a few years ago found that keyword usage in URLs and in the domain actually have a negative correlation to a page’s rank in search results. You should still use keywords to make sure your pages’ URLs are descriptive and accurate, but this is more for user experience (which we’ll touch in a bit). As always in SEO, the way you use keywords in URLs will have an impact on how effective they are at helping a page rank. Think of it from a user’s perspective: will it help a human understand what the page is about? If the answer is yes, you’re good to go. If the answer is no, or even maybe, reconsider your URLs. It’s worth noting here that what are known as "exact match domains" (EMD) have lost significant rankings since Google’s EMD update in 2012. Domains such as keyword-keyword-keyword.com or keyword.keyword.com should probably be avoided. It’s also worth noting here that how you separate words in your URL structure matters for SEO. You have two options: hyphens and underscores. While there might not be a difference for humans, it does matter for Google. Google is better at understanding URLs that use hyphens, as they don’t really recognize underscores (although this seems to be changing). So it’s best to separate words in your URLs using dashes. That being said, if you’re already using underscores, switching to hyphens probably won’t do much to move the needle. Using clear, descriptive and simple URLs is very helpful for humans. It allows them to quickly and easily read a URL and know what to expect from the page. These simple, easy-to-read URLs are known as "clean URLs". 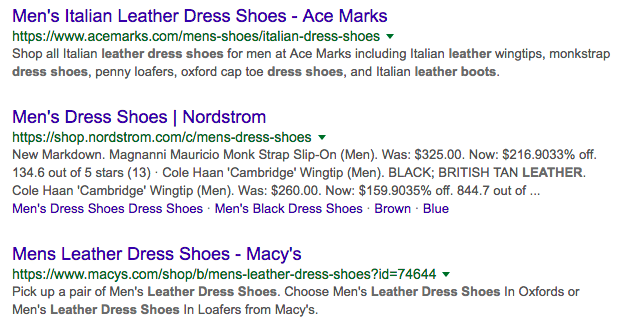 Clean URLs can help make your listing in SERPs look more clickable to users. When a person sees a URL that matches their query or indicates the page will answer the user’s question or help them solve their problem, they’re more likely to click on it. The first 2 results have great URLs — they tell the user exactly what each page will give them after they click on the result. 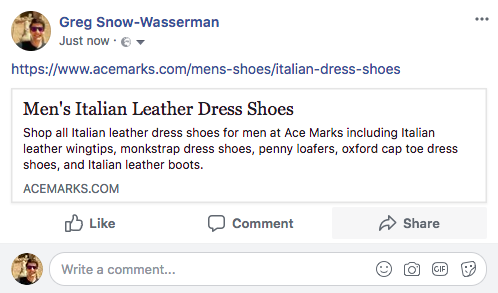 They’ll land on a page that has a list of Italian dress shoes for me. For the third URL, it does give clues that the page is about men’s leather dress shoes, but it’s got a query parameter at the end that lends some ambiguity to the situation. Is it a product page? Category page? Product search result page? To optimize your URLs to encourage user engagement, pretend Google won’t show your page’s title in search results. If that were the case, would a person be able to predict a page’s content based on the result? While many people use anchor text when linking, some people will just copy and paste a URL. In these situations, the URL becomes the anchor text. If you’re using clean URLs, hyphens instead of underscores and keywords, that link will give you a bit more of a boost than something just like https://www.example.com/category/12345. Clean URLs can also help make links more clickable on social platforms like Facebook or Twitter. ...which would you be more likely to click on? Dynamic URLs are URLs that are created by your site’s CMS or server when a user’s browser makes a request for a certain piece of content. These types of URLs are relatively common on database-driven websites like shopping sites where ecommerce platforms can spit out something like https://www.example.com/cat/?pid=5308. While dynamic URLs technically aren’t a problem (Google has been able to properly crawl and index them since at least 2008), leaving them unchecked can cause issues surrounding duplicate and thin pages. They also cause the issue highlighted above when trying to link to the page or share it on social media. The way around the dynamic URL issue to use a rewrite engine to change the appearance of dynamic URLs to better, SEO- and user-friendly URLs. While we’ve discussed the declining influence of URLs on rankings, that doesn’t mean they have no influence on rankings. Getting your URLs right will help make it easier for search engines and people to find and understand your content. Plus, we’ve seen shorter, more SEO-friendly URLs correlate with increased direct traffic as well.